Anything that takes effort can be sold. The same rule applies to video games, of course. It’s only natural that now, mere weeks since launch, people have noticed a couple Pokemon GO accounts for sale. Sites, like Ebay, have accounts listed for sale for $100. These include high trainer levels and rare Pokemon. This practice isn’t a new thing. Even today, players can purchase a World of Warcraft account from multiple sites. 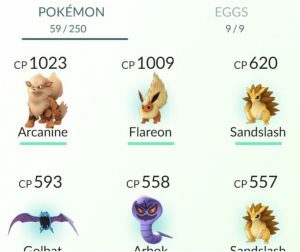 The particular account featured in the image and link above features a level 15 trainer with a CP 1023 Arcanine as top mon. It’s listed at $100 (or best offer). What may be a bit surprising is that, as of writing this, there have been 43 views per hour and 2 watchers. Personally, I can’t imagine grabbing up one of these. I’ve been having a blast getting out of the house and seeing what all I can catch. However, I am also aware that there’s a market for these things. So if you’re wanting to jump on the retail train here, buy a couple incubators, tape your phone to a ceiling fan, and sell at level 15. Is Pokemon GO More Trouble Than It’s Worth? It's fair to say that Pokemon Go has taken the world by storm. Whenever it relea.. Thanks to the hard working minds over at Reddit, we have a neat little trick to ..